Say you have come across some situation which demands you to serve 30 days notice period. For this, you will have to write a format letter and notify the concerned person that notice period will be starting effective what date. 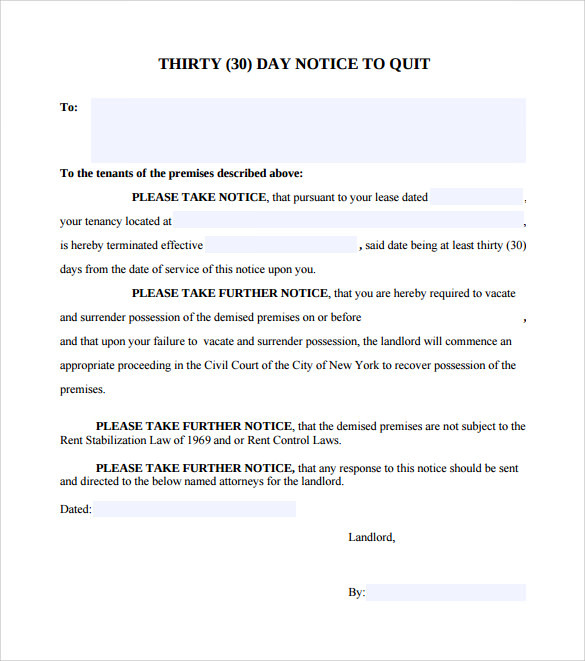 However, different reasons or scenarios for which the notice period is needed, means the matter in the letter has to vary and this is where these sample 30 Day Notice Letters come in to the play. You can download free 30 days notice period letter samples that are professionally written. There are a number of samples you can download from, best suiting your needs! 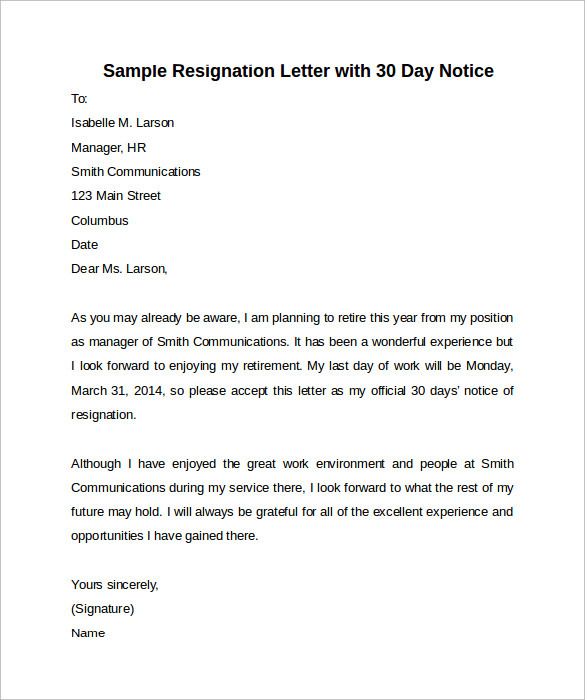 Sample resignation letter with 30 days notice period is a perfect combination of words which can be used by someone to serve their notice. Using this letter, one can notify the company about their motive to leave the company post their notice period. 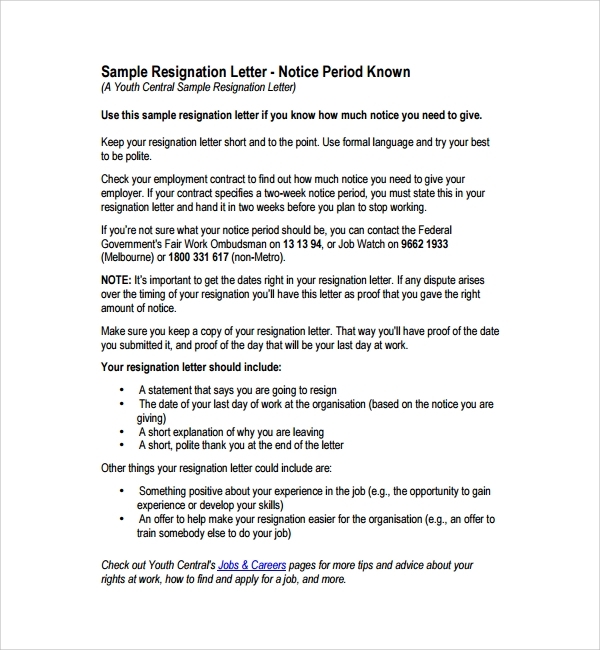 If you need a resignation letter, download this right away! Suppose you have a daycare hired for your kids. But, there are some circumstances due to which you want to terminate their services. This action sometimes requires you to serve a notice period. 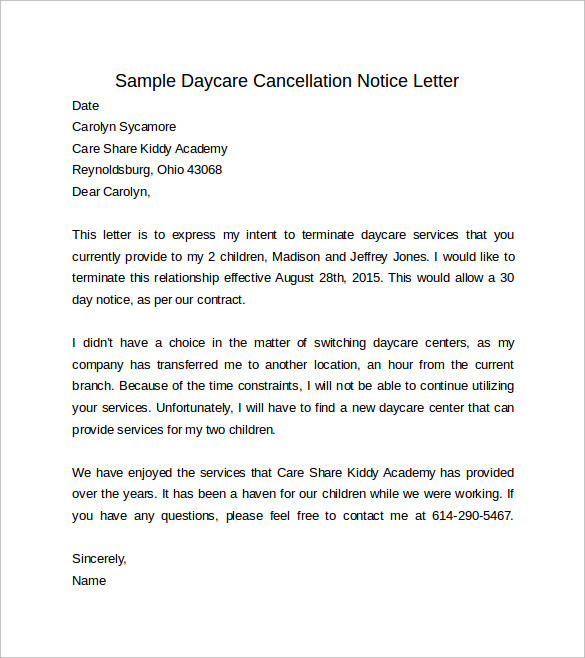 For this, you can easily download free sample daycare cancellation notice letter and modify the letter as per your requirement. Have a house that you have rented to someone & now want it to be evacuated? 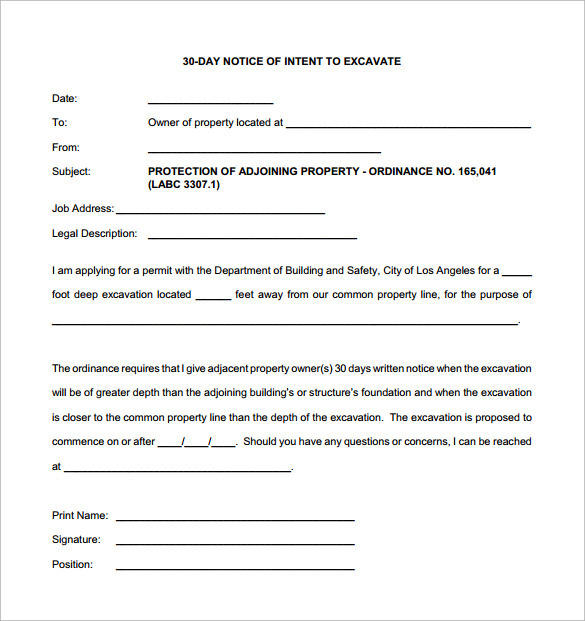 This evacuation job sometimes becomes a headache, but giving a proper notice period will save you from it. 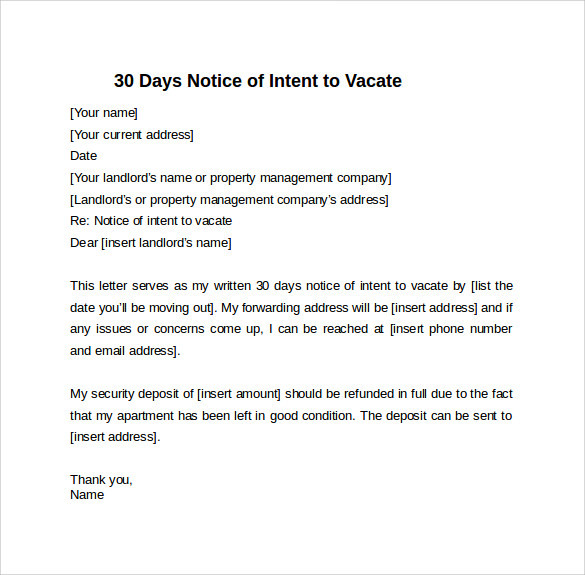 Download free sample 30 days notice letter to ask your tenants to vacate the room, post notice period. Say you live in as a tenant and are about to vacate the place. For this, you will have to give an advance notice to the landlord about your intentions. Doing this can be hassle free if you choose this free sample notice letter of intent to vacate and serve the notice period. 30 days notice letters are very important when it comes to serve a notice period of 30 days. You may have to serve a notice period for a number of reasons and writing a letter by yourself can become quite a hectic job. What if you have some professional writers doing this job for you, that too for free! Yes, these sample notice letters are a perfect example of well written matter when it comes to serve a notice period. Download free notice letters by choosing from a number of letters and modify the same as per your individual needs. A person may come across various situations when he or she has to serve a notice period. Be it to vacate a room, resign from a company or some other scenario. For serving any notice, a formal letter is important as it can serve as a valid document in case of any conflicts. To write this letter can become a challenging job as there should be a proper format which should be in line with the guidelines laid by law. Sample notice letters will serve this need as these letters are written professionally, catering to a large number of scenarios. Sample 30 day notice letters save your time and efforts. Also, formats used in these letters are in guidelines laid by the law or ethics and hence can be used in the court of law, in case of any conflicts. These letters come in to use in a number of scenarios ranging from resigning from a job to terminating some service. These free sample 30 day notice letters are written by professional writers and hence you need not worry about the quality of matter in the letter. However, you can easily modify the letters as per you needs making them a must download template. 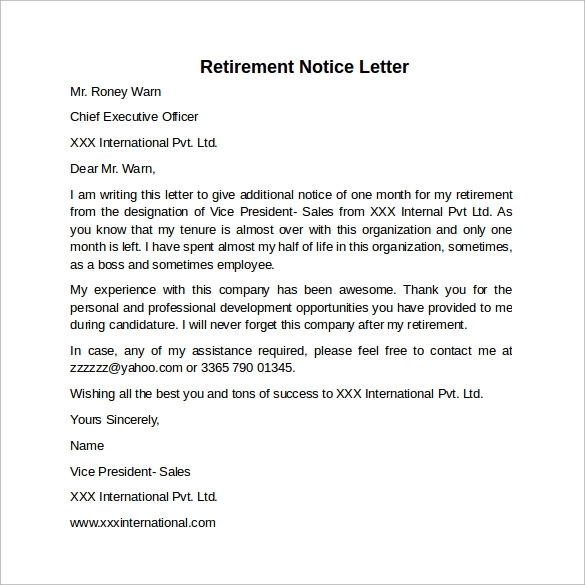 Sample 30 day notice period letters are available for download free of cost. Moreover, these letters have a professional touch which makes them high quality ones. Downloading and using these samples is something that you will never regret. If you need to serve a notice period, download these forms right away!